It's a human thing to want to see your heroes, even your fictional ones, share your likes and dislikes. Political candidates know this, so they wear the caps of teams the majority of their voters cheer. When I read about this film and learned that it was about Virgil Tibbs and the pastor of his church, I wanted to like his pastor, because Tibbs is a fictional hero of mine. In the 1967 Academy Award Best Picture Winner, In the Heat of the Night, Sidney Poitier played a homicide detective from Philadelphia named Tibbs, who's caught up in a murder investigation in the deep South. When someone calls Tibbs, "Boy," he responds "They call me MISTER Tibbs!" with a confident cool in the realm of Steve McQueen's. I love the character of Tibbs, so I wanted to like his pastor and his church in this film. Just couldn't do it, though. 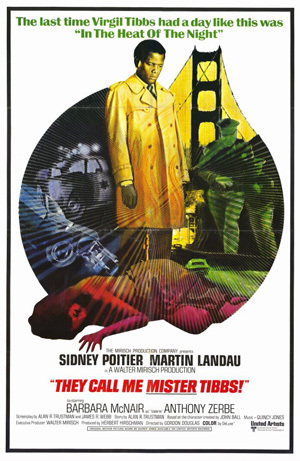 In this film, Tibbs is a detective in San Francisco and has been for years (in the Tibbs novels he works in Pasadena). He's called to assist in the investigation of a prostitute, and it soon becomes apparent that his pastor, Logan Sharpe (Martin Landau), is one of the suspects. One of the most perplexing things in the film is how it handles race. Race is central in the Oscar winning film, but it's pointedly avoided in this film. Sharpe, a white man, seems to be the most prominent liberal pastor in San Francisco in a film made at the time African American pastor Cecil Williams was living that role. 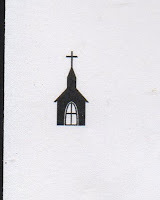 The congregation of Sharpe's church is decidedly multi-ethnic. Sharpe, in the film, seems to be the only person preventing riots in the streets of San Francisco, multi-ethnic riots. (It is certainly possible there could be multi-ethnic riots. But at that time, there were a number of riots taking places. In Watts and other cities there were riots protesting the police and living conditions, but they were primarily African Americans involved. On the campuses, there were anti-war protests primarily involving Caucasians.) It seems MGM wanted to keep the question of race out the film (one assumes for box office reasons). We get to hear one sermon by the Reverend Sharpe, which begins with a quote from Psalm 8 ("What is man that you are mindful of him?") and then turns into a campaign speech for "Proposition 4." He says people have said that you shouldn't listen to him because he is a politician, but what is politics but dealing with people? Surely a man of God should deal with people. He talks about not "fighting the establishment with anger but with votes." From what I remember of Paul's Spiritual Armor, there were such weapons as faith, truth, hope, the gospel and such, but votes were strangely omitted. Actually, I kind of liked what I heard about Proposition 4. Something about turning more decision making over to the local communities. But a pastor's work is more important than mere politics, dealing with eternal rather than temporal issues. So, Sharpe loses my support right there. Now the Rev. Sharpe has some other problems that fall into grand spoiler territory, so if you plan to see the film as a whodunit, you might want to quit right here. So, as much as I like Detective Virgil Tibbs, the Reverend Logan Sharpe and his church gets one steeple.